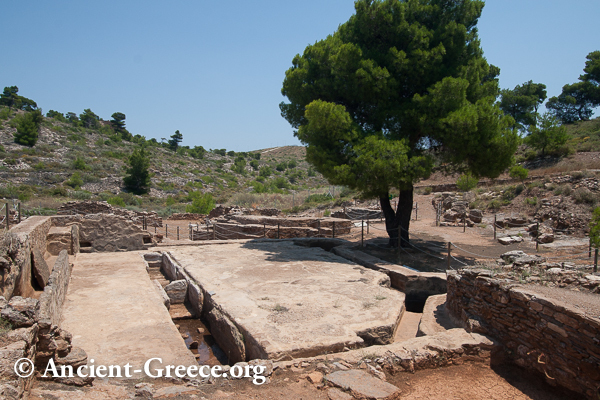 Lavrion's history has been tightly bound to the history of Greece since prehistoric times. There is evidence that mining activities took place as early as the 3d millennium BCE with small scale mining which continued on and off until the classical period. In 483 BCE the discovery of rich vein of silver in the vicinity of modern Ag. 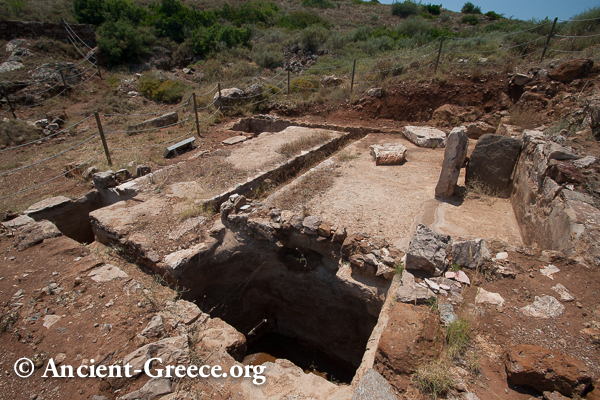 Konstantinos, otherwise known as Maronia, prompted large scale extraction and processing of the mineral by the Athenians. 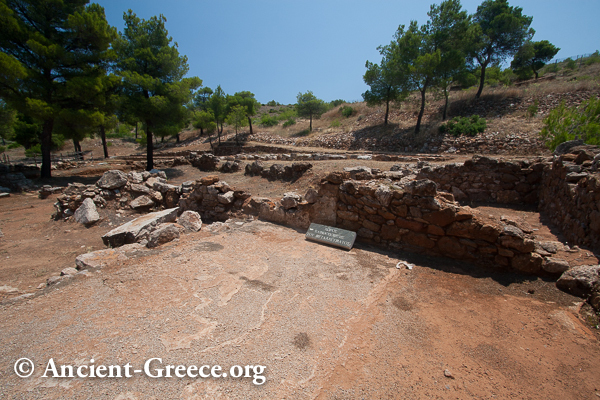 The mines belonged to the city of Athens, and they were rented out to various individuals for a fixed percentage of the production. The most difficult work, including the extracting underground ore was done by slaves, many of whom lost their lives in the harsh process. The wealth produced in the Lavrion mines was initially used at the insistence of Themistokles to construct a formidable navy of war triremes. Athens relied heavily on sea commerce for its wealth and on imports for food, so Themistokles argued that the navy would help Athens in it's long standing rivalry with the island of Aegina, and in the ongoing war with the Persian empire. The Athenian navy proved to be of critical utility soon thereafter, when Xerxes invaded Greece with the Persian army by land and his navy by sea in 480 BCE. His huge Persian army met with defiance, but with initial success on land, but it was imperative that the Greek navy be defeated if the Persians were to supply their huge army by sea. The Athenian navy however, augmented with ships from allied states routed the larger Persian navy at the straits of Salamis. 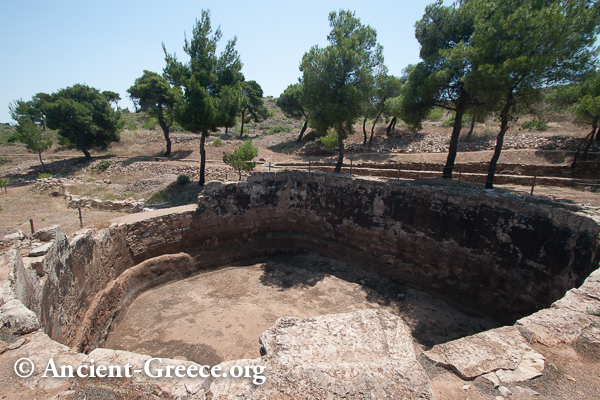 The Lavrion mines thus had a direct and major effect on the creation of the subsequent Athenian empire, and on the celebration of a century of the Golden Age of Athenian democracy that followed. 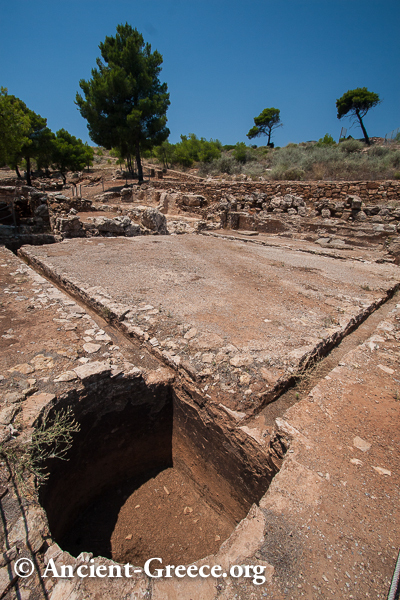 The mines eventually declined during the Peloponnesian War (431-404 BCE) and stopped producing ore when after the Spartans captured the fort of Dekelia in 413 BCE and controlled access to the mines. Afterward, silver and lead extraction continued on and off throughout the subsequent centuries, but production never reached the volume produced during the Classical era. The mines were abandoned in the 6th c. CE, and only reopened in 1859. The extraction of lead, manganese, and cadmium, in addition to smaller quantities of silver helped finance the newly formed country of Greece in the 19th c. CE. 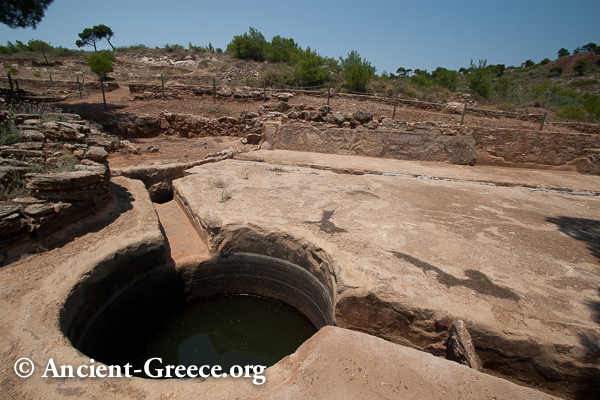 The Lavrion mines were finally abandoned after all the ore deposits was exhausted in 1982. 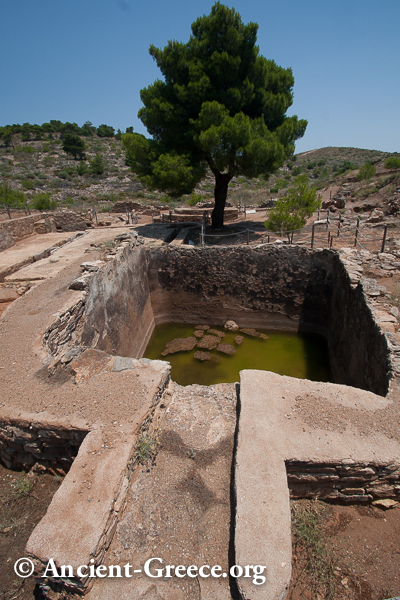 Today, several abandoned mining sites sprinkle the rugged landscape west of the modern town of Lavrion. 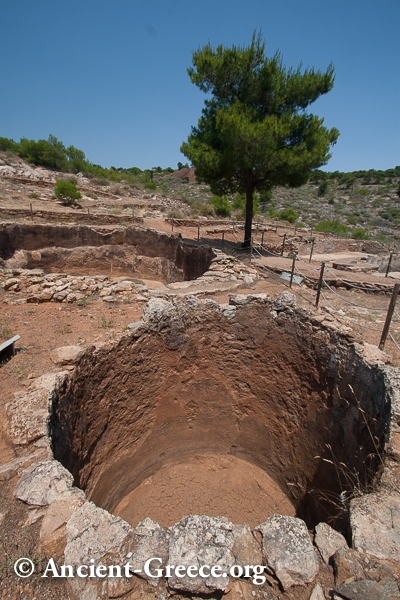 The most prominent archaeological site is located at Agios Konstantinos. The ancient silver production site is poorly signposted, but easily accessible by car. The archaeological site sees few visitors and it's a rough patch of land to negotiate, with no facilities anywhere nearby. 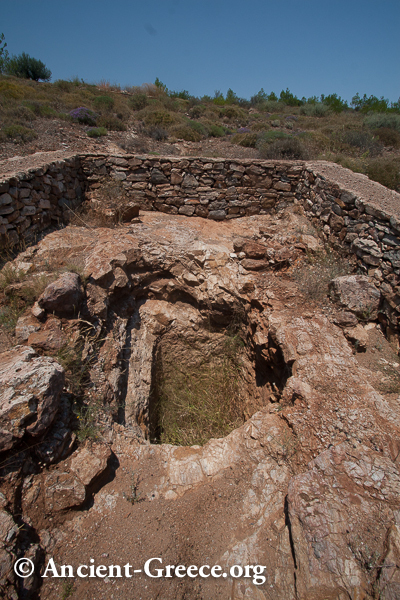 Ancient ore washing table in the Lavrion mines. There are several such tables on the site. 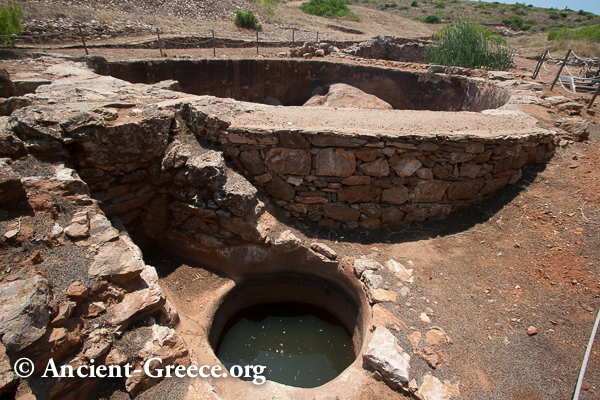 To wash the ore, large quantities of water were collected in basins such as this one. They collected the rain water that was subsequently channeled to the different washing stations on the site. The area where the metal was cast into ingots. The entrance to the mining shaft #7.